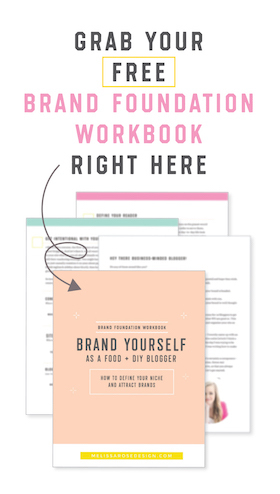 Last week in my Facebook community for Food & DIY bloggers, we talked all about branding and what to do when you already have the colors & fonts chosen for your brand but you aren’t sure what to do with them. You have the font names, you have the color codes, but you still struggle because you don’t know how to arrange the fonts and apply the blog color palette so that your site & graphics look like a branded family. A lot of bloggers tend to think that branding is just made up of a logo & color palette, when in fact the power of branding is found in every graphic, photo, blog/social media post, email, or document you create. Once your designer hands off your branding files, it’s up to you to use that as a guideline to infuse its look and feel into everything you create. 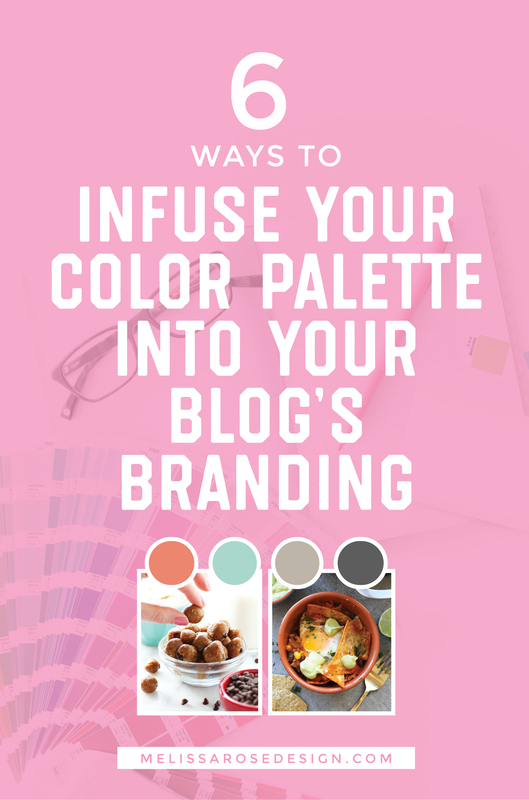 Which I know can be overwhelming and scary, so today I want to show you 6 ways you can infuse your blog’s color palette into your branding materials. 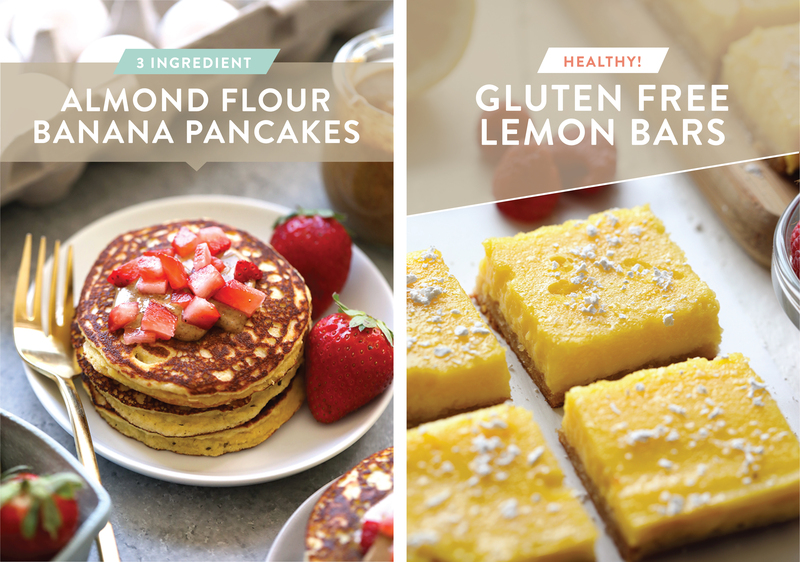 In this example, I’m using the branding from past client Fit Foodie Finds to show you how you can infuse your site’s overall aesthetic into other pieces of the brand. In last week’s Facebook Live, I talked all about how the Pinterest graphics you create are a lot like a billboard. In blogging, we’re not doing the traditional methods of advertising like walking around town handing out flyers, so it can be hard to see how having solid branding can help you promote your blog. But when you have that foundation nailed down, you no longer have to spend 2 hours going back and forth deciding whether or not the fonts/colors fit into your brand..every single time you write a post. 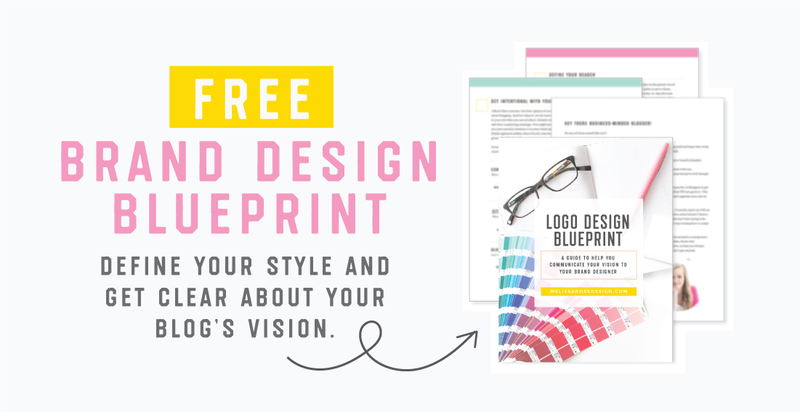 By creating branded text treatments and nailing down where the colors are placed on your image templates, you not only save tons of time each time you create a blog post, but your images also start having a cohesive and branded look. Lee does an amazing job with her photography, in that she has a very distinct look to all of her images. When I’m scrolling through Instagram at 500mph, I can spot one of her images even before seeing her username along side of it. Why is that? Other than her killer bright & crisp aesthetic, Lee is very intentional in the props she uses in her styling. She’ll bring in bowls, cloths, and textures that match or nicely coordinate with her branding. Does this mean that every single image she creates has to include some kind of colored branded prop? Of course not. But by subtly infusing her palette into her styling, her photos are always complementing (not clashing with) her blog design. Along the same lines of props, by infusing your color palette into the surfaces and textures you shoot on, you can help create that streamlined branding throughout your site and social media. In the example above, you can see how Lee takes the tan color in her palette and works it into burlap placemats, as well as infuses the dark gray color into a slate tabletop shot. She’s taking the neutrals in her palette and using them as surfaces and keeping the bright colors as minimal prop accents, which shows just one way you can use your colors in your photography. Unlike my own blog where I use the colors for the backgrounds themselves to give off a upbeat & party-esque vibe, Lee’s use of color gives her photos that healthy & natural vibe while still staying on brand. I can’t tell you how excited I get when a new client comes to me saying they’ve already gotten a photographer booked to take a professional headshot to match the new blog design. I know as bloggers most of prefer being the ones hidden behind the camera but when it comes to branding, having a branded headshot for your site will not only help position you as a professional, but it will also be the cherry on top of a new, branded website. By bringing a touch of your color palette into your jewelry, clothing, furniture, or backdrop, you are giving your sidebar, about page, and social media profiles that professional, branded feel. Again, this does not mean that if your site is all blue that you have to wear a blue shirt and have a blue background. But by infusing small touches of your brand’s colors & textures into the image, you help create a streamlined look. Like I said earlier, branding doesn’t stop with your website design & blog graphics. In every email you send to readers or potential brands, you have the opportunity to further display your professionalism with the marketing collateral you send. 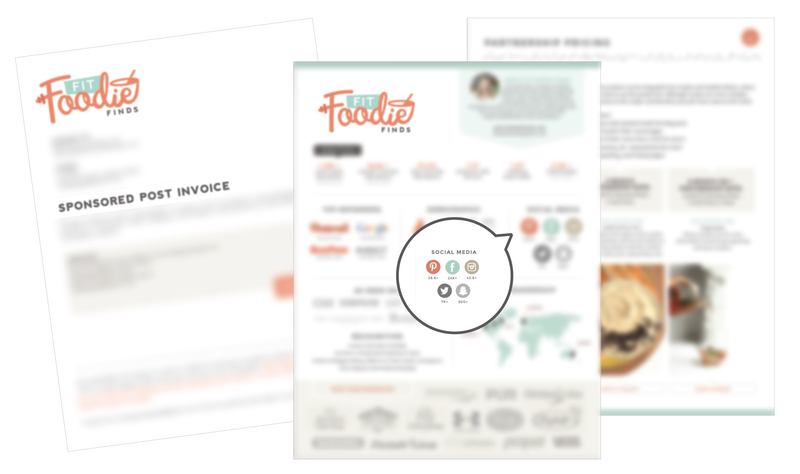 Whether it be a media kit, proposal, or invoice, you can infuse your brand’s aesthetic and colors throughout to make everything look like one, cohesive unit. In Lee’s media kit, we worked to bring in her colors and the fun graphic elements we used on the site into a branded media kit. By branding these PDF’s, she is giving the brands she works with a full branded experience and showing them that the content she creates for them will be just as high caliber and professional. Branching from the branded headshot, you can carry your color palette throughout your social media by incorporating it into things like your Facebook cover image, videos intros, and Pinterest profile. Like you can see below, things like Pinterest board covers can be a great way to use the colors in a different way than the other pieces you create. For example, let’s say that all your images are bright and heavily styled so you use a simple, white font overlay for all your pinnable images instead of using more color. 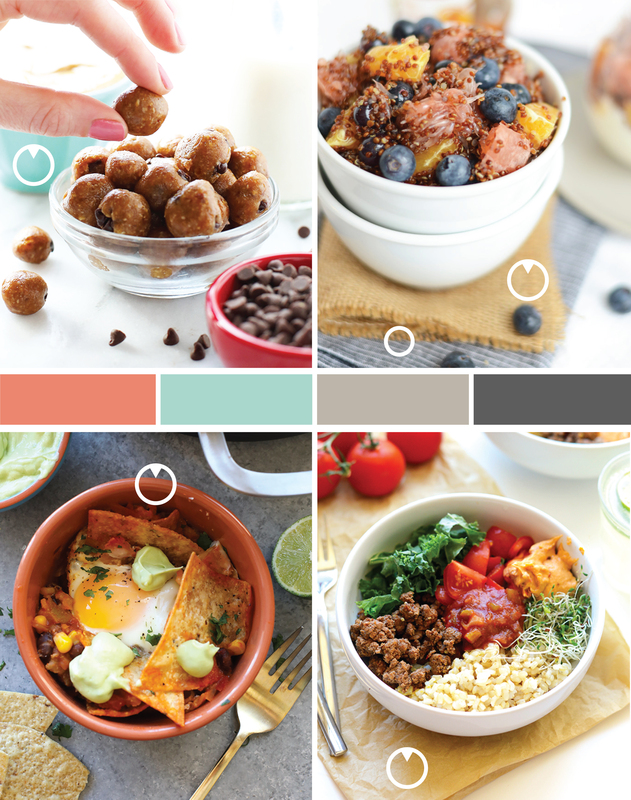 In your Pinterest board graphics, you could use solid color backgrounds to help contrast that. Great branding doesn’t mean everything has to look exactly like, but rather it should look like it’s from the same family and have consistent “features” that help you & your readers make that connection. So that about covers it for today! I hope these examples helped you see how your blog color palette can be used across an entire brand. If you found this helpful, leave me a comment below with 1 thing from this list you will start implementing on your own site. We’ll also be talking more about colors in my free Facebook community for Food & DIY bloggers, The Branding Clubhouse, so if you’re not yet a part of the group be sure to join for more exclusive branding tips! 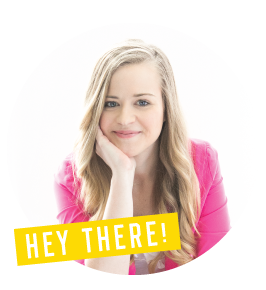 Want to work with me on a new logo or blog design? I take on a limited number of branding clients each month and would love to chat with you about designing your dream logo and brand. Shoot me a message by going here and let’s connect! Food or DIY blog with confidence. "Her level of professionalism and creativity are more than impressive, and the collaboration tool she used made the project flow seamlessly from beginning to end." "Melissa was able to bring my ideas for rebranding - including a new logo, web design and new business cards - to life in ways I couldn't have even imagined." "Her initial questionnaire helped me sift through my goals and she was very organized and timely with deadlines and response time."